Thus began a 20-year journey exploring the role of questioning in a variety of venues. 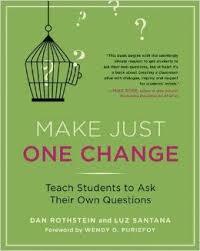 Rothstein and Santana started the Right Question Institute to support questioning in a variety of venues. The key to their recommendations is a protocol for question generation called the Question Formulation Technique (QFT). Questions, of course, have many functions. In school, the QFT serves to support student engagement and learning by having them generate questions around a Question Focus provided by the teacher. This is not “What do you wonder about the world in general?” but “What do you wonder about this statement related to our core content?” This is, of course, the strategy’s greatest strength and its biggest limitation. Having teachers provide the initial stimulus, if done well, means that the questions students generate should raise their curiosity and interest around areas planned for curriculum. This makes the process very school-friendly, while at the same time not being the optimum strategy for someone who wants students to generate individual questions about personal interests. No matter. There are many strategies, and for raising questions about content, this is a very good one. Once the teacher presents a focus statement (or topic), groups of students generate questions using rules very similar to brainstorming. They categorize them as open or closed, understanding that both types can be useful, and practice changing questions from one type to the other to see which best reflect their key interests. Eventually students select the best three questions and use them for short or long term purposes, as determined by the teacher. Here’s an article with just a bit more detail, taken from Educational Leadership. If you’d like to see the QFT at work, see this video collection of examples, taken from the Right Question website. In your toolbox for helping students become questioners, this is a great addition. Take a look at the website, video, article, or book and see what might work for you.